Comprehension is the ability to utilize lower order reading processes (including decoding and vocabulary knowledge) and higher order processes (including relation of text content to schema and conscious controllable processing) to understand concepts and ideas from text. (Holdgreve-Resendez, 2010a), (Pressley, 2000). 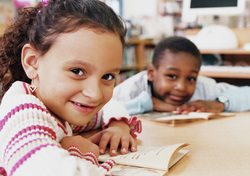 Comprehension is a key tool in literary development. Without comprehension, there is little reason in attempting to read. A student must process what he or she is reading to effectively understand the concepts of the text. These assessments are great to test a child's comprehension! Cloze Test (McKenna and Stahl, 2009). San Diego Quick Assessment Form 1 (McKenna and Stahl). Second Language Learners would struggle with comprehension. When a student is just learning English, it can be challenging to think in English. Many students will read in English, translate it in their head to their native tongue and then comprehend it. This takes a lot of time and is why many SLL struggle with fluency and comprehension! This YouTube video demonstrates some struggles that SLL might have with reading comprehension. It also gives some strategies on how to improve comprehension! This video can be used by teachers to teach their students tools and techniques for reading. This YouTube video gives tips to parents of young children. It demonstrates to parents or guardians on how to aid their child. Ellery, V. (2010). How do we teach reading as a strategic, decision-making process?. The Reading Teacher, 63(5), 434-436. Golbeck, A, Paschal, A, Jones, A, & Hsiao, T. (2010). Correlating reading comprehension and health numeracy among adults with low literacy. Elsevier. Holdgreve-Resendez, R. T. (2010). Comprehension Fall 2010. Extracted from www.angel.msu.edu on November 17, 2010. Comprehension. Celce-Murcia, M., & Larsen-Freeman, D. (1983). The grammar book: An ESL/EFL teacher’s course. Holdgreve-Resendez, R.T. (2010). Comprehension Fall 2010. Extracted from www.angel.msu.edu on November 17, 2010. Comprehension. McGill-Franzen, A. (2010). The national early literacy panel report: summary commentary, and reflections on policies and practices to improve children's early literacy. Educational Researcher, 39(4), 275-278.